The Savvy Stamper: Blog Candy!!! Would you be interested in some blog candy in honor of my new venture? Since having a little girl, I have been making hair bows/clippies for her, and decided to open my own little Esty shop to share! So I will share with you! 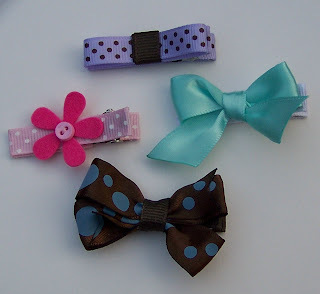 I am giving away a sampling of different bows I made (all are on alligator clips approx 2" in length). Please check out my Esty shop - daisiesandsunshine - for more creations! To be eligible for this blog candy, please enter your name and link. If you have a blog and help spread the word with a link to this post or my Esty shop, you can enter your name a second time (please mark blog post on Mr Linky), AND if you become a follower of this blog (or are already), please make a third entry on Mr Linky and mark with Follower. A random winner will be chosen on Wednesday, July 21. Thanks for stopping by and be sure to scroll down for current postings. No little girls left in the house, but just wanted to say I think they're adorable! So cute! I have 2 girls, so these would get used in my house :) Adding the picture to my blog right now. Don't think my boys would let me put them in their hair though!